Stephen Douglas, the sponsor of the Kansas-Nebraska Act as well as the most vocal supporter of popular sovereignty, was known as the "Little Giant" because of his small stature. 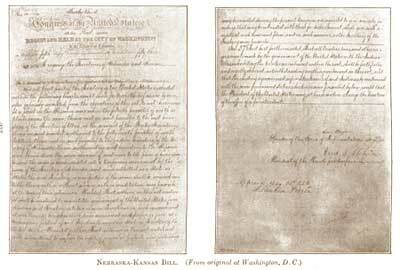 The Kansas-Nebraska Act of 1854 may have been the single most significant event leading to the Civil War. By the early 1850s settlers and entrepreneurs wanted to move into the area now known as Nebraska. However, until the area was organized as a territory, settlers would not move there because they could not legally hold a claim on the land. The southern states' representatives in Congress were in no hurry to permit a Nebraska territory because the land lay north of the 36°30' parallel — where slavery had been outlawed by the Missouri Compromise of 1820. Just when things between the north and south were in an uneasy balance, Kansas and Nebraska opened fresh wounds. The person behind the Kansas-Nebraska Act was Senator Stephen A. Douglas of Illinois. The Kansas-Nebraska Act began a chain of events in the Kansas Territory that foreshadowed the Civil War. He said he wanted to see Nebraska made into a territory and, to win southern support, proposed a southern state inclined to support slavery. It was Kansas. Underlying it all was his desire to build a transcontinental railroad to go through Chicago. 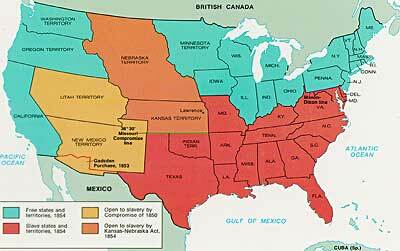 The Kansas-Nebraska Act allowed each territory to decide the issue of slavery on the basis of popular sovereignty. Kansas with slavery would violate the Missouri Compromise, which had kept the Union from falling apart for the last thirty-four years. The long-standing compromise would have to be repealed. Opposition was intense, but ultimately the bill passed in May of 1854. Territory north of the sacred 36°30' line was now open to popular sovereignty. The North was outraged. The Kansas-Nebraska act made it possible for the Kansas and Nebraska territories (shown in orange) to open to slavery. The Missouri Compromise had prevented this from happening since 1820.
Who benefitted the most from the Kansas-Nebraska Act? The political effects of Douglas' bill were enormous. Passage of the bill irrevocably split the Whig Party, one of the two major political parties in the country at the time. Every northern Whig had opposed the bill; almost every southern Whig voted for it. With the emotional issue of slavery involved, there was no way a common ground could be found. Most of the southern Whigs soon were swept into the Democratic Party. Northern Whigs reorganized themselves with other non-slavery interests to become the Republican Party, the party of Abraham Lincoln. This left the Democratic Party as the sole remaining institution that crossed sectional lines. Animosity between the North and South was again on the rise. The North felt that if the Compromise of 1820 was ignored, the Compromise of 1850 could be ignored as well. Violations of the hated Fugitive Slave Law increased. Trouble was indeed back with a vengeance. From Furman University an outstanding compilation of about 40 newspaper editorials relating to the Kansas-Nebraska Act. Well-organized with a snippet from each editorial so that the reader can grasp the piece's point of view. One Connecticut Senator that supported the Act was hung in effigy by his constituents, while they yelled, "Toucey the Traitor!" Franklin Pierce, President at the time the Kansas-Nebraska Bill was passed, has been called America's most-obscure and best-looking President.